Renfield (Dwight Frye) is a solicitor traveling to Count Dracula's (Bela Lugosi) castle in Transylvania on a business matter. The people in the local village fear that vampires inhabit the castle and warn Renfield not to go there. Renfield refuses to stay at the inn and asks his carriage driver to take him to the Borgo Pass. Renfield is driven to the castle by Dracula's coach, with Dracula disguised as the driver. En route, Renfield sticks his head out the window to ask the driver to slow down, but sees the driver has disappeared; a bat leads the horses. Aboard the schooner Vesta, Renfield is a raving lunatic slave to Dracula, who hides in a coffin and feeds on the ship's crew. When the ship reaches England, Renfield is discovered to be the only living person. Renfield is sent to Dr. Seward's sanatorium adjoining Carfax Abbey. At a London theatre, Dracula meets Seward (Herbert Bunston). Seward introduces his daughter Mina (Helen Chandler), her fiancé John Harker (David Manners) and the family friend Lucy Weston (Frances Dade). Lucy is fascinated by Count Dracula. That night, Dracula enters her room and feasts on her blood while she sleeps. Lucy dies the next day after a string of transfusions. Renfield is obsessed with eating flies and spiders. Professor Van Helsing (Edward Van Sloan) analyzes Renfield's blood and discovers his obsession. He starts talking about vampires, and that afternoon Renfield begs Seward to send him away, claiming his nightly cries may disturb Mina's dreams. When Dracula calls Renfield with wolf howling, Renfield is disturbed by Van Helsing showing him wolfsbane, which Van Helsing says is used for protection from vampires. Mina leaves her room and runs to Dracula in the garden, where he attacks her. She is found by the maid. Newspapers report that a woman in white is luring children from the park and biting them. Mina recognizes the lady as Lucy, risen as a vampire. Harker wants to take Mina to London for safety, but is convinced to leave Mina with Van Helsing. Van Helsing orders Nurse Briggs (Joan Standing) to take care of Mina when she sleeps, and not to remove the wreath of wolfsbane from her neck. Renfield escapes from his cell and listens to the men discuss vampires. Before his attendant takes Renfield back to his cell, Renfield relates to them how Dracula convinced Renfield to allow him to enter the sanitorium by promising him thousands of rats with blood and life in them. Dracula enters the Seward parlour and talks with Van Helsing. Dracula states that Mina now belongs to him, and warns Van Helsing to return to his home country. Van Helsing swears to excavate Carfax Abbey and destroy Dracula. Dracula attempts to hypnotize Van Helsing, but the latter's resolve proves stronger. As Dracula lunges at Van Helsing, he withdraws a crucifix from his coat, forcing Dracula to retreat. Already a huge hit on Broadway, the Deane/Balderston Dracula play would become the blueprint as the production gained momentum. The screenwriters carefully studied the silent, unauthorized version, F. W. Murnau's Nosferatu, for inspiration. Lifted directly from a nearly identical scene in Nosferatu that does not appear in Stoker's novel, was the early scene at the Count's castle when Renfield accidentally pricks his finger on a paper clip and it starts to bleed. Dracula creeps toward him with glee, only to be repelled when the crucifix falls in front of the bleeding finger. The peasants at the beginning are praying in Hungarian, and the signs of the village are also in Hungarian. This was because when Bram Stoker wrote the original novel, the Borgo Pass was near Transylvania and modern Hungary. This part of the world was then part of the Kingdom of Hungary and within the Austro-Hungarian Empire. Now that area is part of Romania. The film's histrionic dramatics from the stage play are also reflected in its special effects, which are limited to fog, lighting, and large flexible bats. Dracula's transition from bat to person is always done off-camera. The film also employs extended periods of silence and character close-ups for dramatic effect, and employs several intertitles and a closeup of a newspaper article to advance the story, holdovers from silent films. One point made by online film critic James Berardinelli is that the actors' performance style seems to belong to the silent era. Director Tod Browning had a solid reputation as a silent film director, having made them since 1915, but he never felt completely at ease with sound films. He only directed a few more, the next one being the notorious Freaks, a horror movie with Baclanova and a cast of actual carnival freaks that was yanked from distribution immediately. Browning directed his last film in 1939. Due to the costs of adding an original musical score to a film's soundtrack, no score had ever been composed specifically for the film. The music heard during the opening credits, an excerpt from Act II of Tchaikovsky's Swan Lake, was re-used in 1932 for another Universal horror film, The Mummy. During the theatre scene where Dracula meets Dr. Seward, Harker, Mina and Lucy, the end of the overture to Wagner's Die Meistersinger von Nürnberg can also be heard as well as the dark opening of Schubert's "Unfinished Symphony" in B minor. The film, with this new score, was released by Universal Studios in 1999 in the VHS format. Universal's DVD releases allow the viewer to choose between the unscored soundtrack or the Glass score. The soundtrack, Dracula, was released by Nonesuch Records in 1999. Glass and the Kronos Quartet performed live during showings of the film in 1999, 2000 and 2017. When the film finally premiered at the Roxy Theatre in New York on February 12, 1931 (released two days later throughout the United States), newspapers reported that members of the audiences fainted in shock at the horror on screen. This publicity, shrewdly orchestrated by the film studio, helped ensure people came to see the film, if for no other reason than curiosity. Dracula was a big gamble for a major Hollywood studio to undertake. In spite of the literary credentials of the source material, it was uncertain if an American audience was prepared for a serious full length supernatural chiller. Though America had been exposed to other chillers before, such as The Cat and the Canary (1927), this was a horror story with no comic relief or trick ending that downplayed the supernatural. Nervous executives breathed a collective sigh of relief when Dracula proved to be a huge box office sensation. Within 48 hours of its opening at New York's Roxy Theatre, it had sold 50,000 tickets, building a momentum that culminated in a $700,000 profit, the largest of Universal's 1931 releases. The film was generally well received by critics. Mordaunt Hall of The New York Times called it "the best of the many mystery films", characterizing Browning's direction as "imaginative" and Helen Chandler's performance as "excellent". Variety praised the film for its "remarkably effective background of creepy atmosphere" and wrote, "It is difficult to think of anybody who could quite match the performance in the vampire part of Bela Lugosi, even to the faint flavor of foreign speech that fits so neatly." Film Daily declared the film "a fine melodrama" and also lauded Lugosi's performance, calling it "splendid" and remarking that he had created "one of the most unique and powerful roles of the screen". Time called it "an exciting melodrama, not as good as it ought to be but a cut above the ordinary trapdoor-and-winding-sheet type of mystery film." John Mosher of The New Yorker wrote a negative review, remarking that "there is no real illusion in the picture" and "This whole vampire business falls pretty flat". The Chicago Tribune did not think the film was as scary as the stage version, calling its framework "too obvious" and "its attempts to frighten too evident", but still concluded that it was "quite a satisfactory thriller." The film was originally released with a running time of 85 minutes; when it was reissued in 1936, the Production Code was enforced. For that reissue, two scenes are known to have been were censored. The most significant deletion was an epilogue which played only during the film's initial run. In a scene similar to the prologue from Frankenstein, and also featuring Universal stalwart Edward Van Sloan, he reappeared in a "curtain speech" and informed the audience: "Just a moment, ladies and gentlemen! A word before you go. We hope the memories of Dracula and Renfield won't give you bad dreams, so just a word of reassurance. When you get home tonight and the lights have been turned out and you are afraid to look behind the curtains — and you dread to see a face appear at the window — why, just pull yourself together and remember that after all, there are such things as vampires!" This epilogue was removed out of fear of encouraging a belief in the supernatural. This scene was briefly shown in the Road to Dracula documentary, but it may be unusable and can't be restored. Audio of Dracula's off-camera "death groans" at the end of the film were shortened by partial muting, as were Renfield's screams as he is killed; these pieces of soundtrack were later restored by MCA-Universal for its laser disc and subsequent DVD releases (with the exception of the 2004 multi-film "Legacy Collection" edition). Bela Lugosi and Edward Van Sloan. Browning would go on to direct Lugosi once more in another vampire thriller, Mark of the Vampire, a 1935 remake of his lost silent film London After Midnight (1927). Original posters from the 1931 release (see below picture, top row) are very rare and extremely valuable, typically auctioning for more than $100,000. In 2009, an original one sheet then owned by actor Nicolas Cage sold for $310,700. Re-release posters (see below picture, bottom row) are also valuable. In 1936, five years after release, Universal released Dracula's Daughter, a direct sequel that starts immediately after the end of the first film. A second sequel, Son of Dracula starring Lon Chaney, Jr., followed in 1943. The Count returned to life in three more Universal films of the mid-1940s: 1944's House of Frankenstein, 1945's House of Dracula and 1948's comedy Abbott and Costello Meet Frankenstein. Universal would only cast Lugosi as Dracula in one more film, the aforesaid Abbott and Costello vehicle, giving the role to John Carradine for the mid-1940s "monster rally" films, although Carradine admittedly more closely resembled Stoker's physical description from the book. Many of the familiar images of Dracula are from stills of the older Lugosi made during the filming of the 1948 comedy, so there remain two confusingly distinct incarnations of Lugosi as Dracula, seventeen years apart in age. 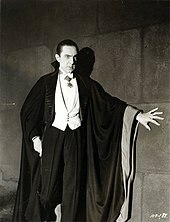 As Lugosi played a vampire in three other movies during his career, this contributed to the public misconception that he portrayed Dracula on film many times. In the early days of sound films, it was common for Hollywood studios to produce "Foreign Language Versions" of their films using the same sets, costumes and so on. 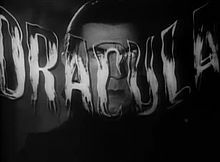 While Browning filmed during the day, at night George Melford was using the sets to make the Spanish-language version Drácula, starring Carlos Villarías as Conde Drácula. Long thought lost, a print of this Dracula was discovered in the 1970s and restored. This was included as a bonus feature on the "Classic Monster Collection" DVD in 1999, the "Legacy Collection" DVD in 2004, the "75th Anniversary Edition DVD" set in 2006, and on "Universal Monsters: The Essential Collection" on Blu-ray in 2012. A third, silent, version of the film was also released. In 1931, some theaters had not yet been wired for sound and during this transition period, many studios released alternative silent versions with intertitles. ^ a b "Dracula". The Film Daily (Volume 55) Jan–Jun 1931, February 15 Issue, Page 11. ^ "41 Things We Learned from the 'Dracula' Commentary". October 9, 2014. ^ "Philip Glass + Kronos Quartet: Dracula". Nonesuch Records. Retrieved May 12, 2009. ^ Horsley, Paul (November 1, 2000). "The Glass Monster Menagerie: Composer, Kronos Quartet Turn Dracula into Performance Art". The Kansas City Star. p. F6. ^ Dyer, Richard (February 1, 2002). "A 'Nuevo' Sound from Kronos". The Boston Globe. ^ Economy, Jeff (October 27, 2000). "A Triple Treat of Dracula". Chicago Tribune. p. 3. ^ Vieira, Mark A. (2003). Hollywood Horror: From Gothic to Cosmic. New York: Harry N. Abrams, Inc. p. 35. ISBN 0-8109-4535-5. ^ Hall, Mordaunt (February 13, 1931). "The Screen; Bram Stoker's Human Vampire". The New York Times. New York: The New York Times Company. Retrieved December 7, 2014. ^ "Dracula". Variety. New York: Variety, Inc. February 18, 1931. p. 14. ^ "Dracula". Film Daily. New York: Wid's Films and Film Folk, Inc.: 11 February 15, 1931. ^ Snider, Eric D. (November 17, 2009). "What's the Big Deal? Dracula (1931)". Film.com. MTV Networks. Archived from the original on March 3, 2016. Retrieved December 7, 2014. ^ Mosher, John (February 21, 1931). "The Current Cinema". The New Yorker. New York: F-R Publishing Corporation. p. 63. ^ "Awed Stillness Greets Movie, about 'Dracula'". Chicago Tribune. Chicago: Tribune Publishing. March 21, 1931. p. 21. 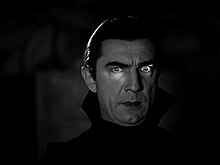 ^ "Rewind @ www.dvdcompare.net – Dracula (1931)". dvdcompare.net. ^ "Parhaat Netticasinot ja esittelyt – Tutustu ja lunasta suosituimmat casinobonukset!". Parhaat Netticasinot ja esittelyt. Archived from the original on November 4, 2013. ^ Jr, William M. Kaffenberger; Rhodes, Gary D.; Croft, Ann (May 25, 2015). Bela Lugosi in Person. Albany, GA: BearManor Media. ISBN 9781593938055. ^ Pulver, Andrew (March 14, 2012). "The 10 most expensive film posters – in pictures". the Guardian. Retrieved June 1, 2016. ^ Weaver, Tom; Michael Brunas; John Brunas (2007). Universal Horrors: The Studio's Classic Films, 1931–1946. McFarland. p. 35. ISBN 0786491507. Retrieved March 24, 2013. For decades it remained a lost film, scarcely eliciting minimal interest from the studio which produced it.